Previously, schools have concentrated primarily on narrative writing such as storytelling and personal narratives. The Common Core writing standards will also emphasize informative, research, and opinion writing. Those of you that encourage journaling at home should start asking your children to research something of interest to them and then write down facts from their research. This will help prepare your children for the informative and research writing components of the Common Core writing standards. For opinion writing, have your children write a letter that convinces you to change their bedtime or buy them something, etc. Make sure they back up the letter with supporting evidence. 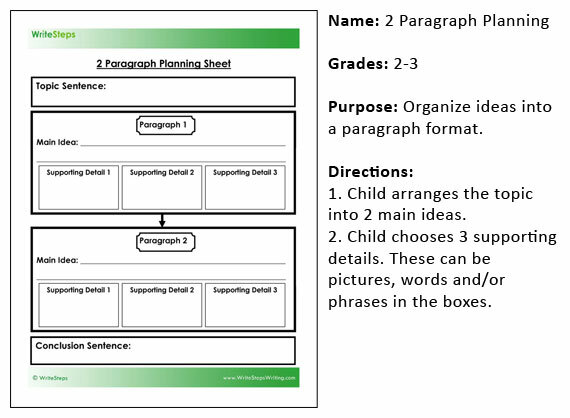 This is an example of a paragraph planning sheet parents can use at home to assist with writing. Visit our blog for more resources. The writing Common Cores say students should write pieces over short periods of time as well as over extended time frames. Therefore, encourage your children to write chapter books as well as daily quick writes. Tips were provided by Arlynn King, Professional Development Coach at WriteSteps. Arlynn King has 37 years of elementary teaching experience. We were inspired by the Act of Kindness campaign that has kicked off, due to a tweet from NBC News’ Ann Curry. 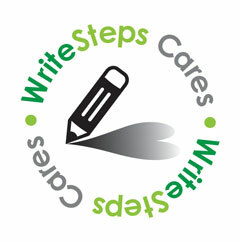 WriteSteps is participating in the campaign in a number of ways. We created writing prompts to help students express themselves during a time of grief and/or tragedy. Writing can be very therapeutic and is a wonderful tool for students. Click here to be directed to our writing prompts blog post and make sure to pass the prompts on to anyone that will benefit from them. Stay tuned for more Acts of Kindness from the WriteSteps team! WriteSteps is Searching for TeacherStars like You! If you are a current WriteSteps teacher we have a contest for you! We know from experience that modeling is a powerful tool. One of the best ways to teach an effective lesson is to watch someone else teach it first. We are seeking a dream team of teachers to educate other teachers around the nation with WriteSteps lessons. This is an opportunity for you to show off your teaching craft and make an impact outside of your classroom nationally. We are asking you to submit a video(s) teaching a complete WriteSteps lesson. Our goal is to have all of our lessons videotaped and posted on eWriteSteps, so teachers around the nation will be able to watch master teachers teaching WriteSteps lessons. Are you ready to take the next step and share your WriteSteps lessons with the nation? If you are a current teacher using WriteSteps please contact [email protected] to receive the guidelines for the TeacherStar© contest! With a positive outlook and engaging personality, Awareness Ambassador Nicole Simms brings not only 15 years of elementary school teaching experience to the WriteSteps team, but also a passion for writing and helping children through the various organizations she is involved in. 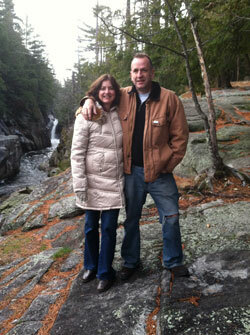 Awareness Ambassador Nicole Simms, with her husband Jon Simms, near their cottage on the Ausable River in Wilmington, NY. Other than writing, Nicole loves to travel and read. She also enjoys hiking, skiing, swimming, and kayaking with her husband, family, and friends, in Maine and the Adirondack Mountains of New York. Spirituality is important to Nicole and she is currently a volunteer for an anti-child trafficking organization. We have a busy few weeks sharing insights on K-5 writing and grammar for the Common Core in Nashville, Denver, and Milwaukee! If you are in the area stop by and say hello to the WriteSteps team! We’ll be holding drawings for lessons too, so come see us and register to win! Awareness Ambassador Kim Gates will exhibit at the National Title 1 Conference, located in the Gaylord Opryland Hotel & Convention Center. Come say hello and get all of your Common Core writing questions answered! WriteSteps will exhibit at the Colorado Council International Reading Association’s Conference on Literacy, at the Denver Marriott Tech Center. Stop by our booth and say hello to our Awareness Ambassador Kim Gates! Stop by the WriteSteps exhibit at the Wisconsin State Reading Associations’ 2013 Convention, and learn more about our research-based, award-winning, 100% K-5 Common Core writing and grammar program!